The Big Idea: Giving new things a try helps children learn, grow, and take on challenges! Point out to kids and parents that we’re always growing and learning (not just kids…grown-ups too! ), and that they’re going to create a tree that shows exactly that. Distribute the printable page (one per family) and have them think of things they have learned to do (or learned about) recently. They can also talk about things they weren’t able to do before, but can do now that they’ve practiced. 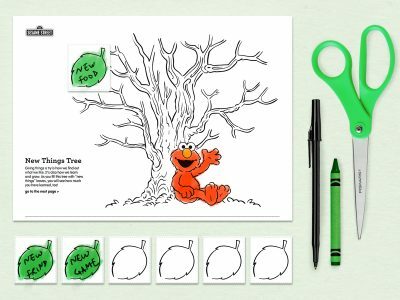 Distribute “Elmo’s New Things Tree” and leaves. Families can work together to label or draw pictures of new things they’ve tried and learned, and complete the activity. As a group, create a giant tree on the wall using colored sticky notes. Families can write what’s on their leaves on colored sticky notes and arrange on the wall in the shape of a tree.